Wormholes - Tunnels Through Space and Time. Wormholes – Tunnels Through Space and Time. A worm hole is a theoretical hole joining two distant parts of space and/or time via a hole, or short cut between the two regions. A familiar model used to visualize such a phenomenon is that of the subway system connecting distant parts of a city through underground, direct routes. This model however doesn’t quite fit because a wormhole actually shortcuts physical space or distance. In theory, a wormhole could allow us to travel to distant parts of space faster than at the speed of light, and possibly forward and backward through time. One issue with worm holes is that the same equations that allow for them to form, also say that the hole will nearly simultaneously close, crushing anything inside the hole. 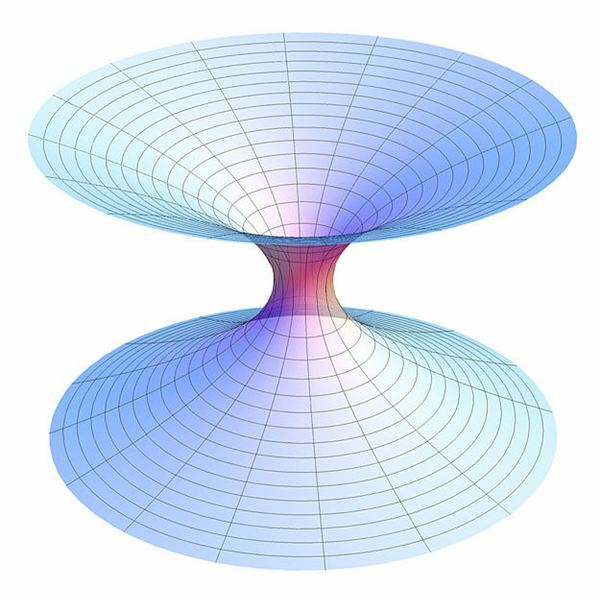 Some have theorized that there could be some type of "exotic" matter that might be able to keep the wormhole open due to antigravity effects that the matter would have; but this matter most likely also would need to be humanly produced or created in some way. Stable worm holes don’t occur naturally in space as far as we know, but it may be possible one day to manipulate an area of space where worm holes are forming and simultaneously disappearing, and keep those holes open with negative or exotic matter. What Characteristics Might a Wormhole Possess? As was mentioned above, the connection of distant parts of space and/or time, and the almost immediate closing of the hole when it opens. Another feature of them, and possibly a discouraging one, is if a worm hole were to open, and stay open long enough for someone or something to go through it, that person or thing would have no idea where they were headed, most likely; and if the hole were then to close once the person or thing got to, say, the "middle" of billions of light-years of nothing, or arrived in the middle of some star or black hole, then there would obviously be no return. So there would be a great deal of risk involved. However, the enticing thing about worm holes is that they could allow us to access parts of the universe that would otherwise be inaccessible. Including travel back and forth in time. A worm hole opens, say, between Earth and the Moon, we get to it, send a robot along, it ends up in Andromeda, it could get there in an incredibly brief amount of time: hours, minutes, days–we’re really not sure, but relatively very, very quickly. So it’s easy to see the benefit a worm hole might bring to our existence and our attempts to sustain our species existence, especially if we could control them and create them to an extent utilizing exotic matter. Time travel is where a worm hole gets a little more tricky. Logically. We run into some paradoxes with travel into the past, such as the Grandfather Paradox, which generally states: If I go back in time, and run into my grandpa, or great-grandpa, I could feasibly shoot him and kill him before he had my father or grandfather and then I wouldn’t exist in the first place to go back in time and shoot him. There is a similar paradox in the plot of the film Terminator. It has been shown through experiment that clocks do indeed move at a quicker rate the farther they are from massive bodies (gravity fields), or the slower they are traveling compared to the speed of light, and so in essence someone out in space is moving through time faster than myself. But that doesn’t necessarily mean that they can see into some categorical and objective past when they look down at Earth through, say, some sort of telescope; they of course would still be seeing the present. And of course the differences in the the speed of time passing is negligible at that scale for the most part, although GPS satellites do have to take into consideration that time is moving slower on Earth than where they are orbiting in order to function properly. But this is not an article on the physics and logistics of time travel, just a discussion of wormholes. So let’s just suffice to say that most time travel models through wormholes right now have to do with the principles mentioned above, that time passes quicker the slower the object is moving relative to the speed of light, and the closer an object is to a massive body, such as Earth or the Sun. With those principles in mind, people are theorizing that if one mouth of a wormhole was to open near Earth, and the other mouth to open in space where no massive bodies are near, we from our end would be looking and traveling into the "future," and that persons or things coming from the other end would be looking and traveling into the "past." However, some have theorized that if we were to create a time-travel worm hole, that in the very process of making it there would be such an intense build up of radiation that the worm hole would be destroyed by the radiation. So although worm holes are not known to exist, except possibly in an incredibly unstable state, they are allowed for in the laws of physics. Time travel via wormhole presents a variety of logical paradoxes and layers of abstraction to consider, but that’s not to say that we should rule it out. It would be a technology or capability that is beyond our understanding for the time being, but things are always changing.